Expedition 40 cosmonauts Alexander Skvortsov and Oleg Artemyev successfully concluded a flawless spacewalk on Monday, focused on science experiments placed on the exterior of the Russian segment of the International Space Station (ISS). The EVA – designated RS-39 – began at 10:02am Eastern and was concluded over one hour ahead of schedule. The EVA began with the opening of the Pirs airlock hatch by Artemyev. Skvortsov was designated as extravehicular (EV) crew member 1 and was wearing the Orlan suit bearing red stripes. Artemyev was designated as extravehicular EV-2 and was wearing a suit with blue stripes. Following a humorous conversation about trying to contort themselves into position, in order to reach the hatch handle, the cosmonauts egressed and climbed out of the airlock to the EVA ladder. 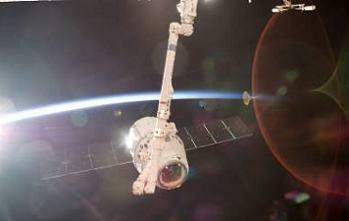 There they performed the first task, which was the deployment of a small satellite. The satellite is called Nanosatellite-1 (NS-1) – but is also sometime referred to as the Peruvian CubeSat Chasqui – weighing just 1.5 kilograms. NS-1 is capable of transmitting images and telemetry back to Earth. It arrived on the Station during a recent Progress resupply mission. After deploying the nanosatellite, the EVA team moved to retrieve the Expose-R experiment from the airlock before translating to the Zvezda service module plane II. 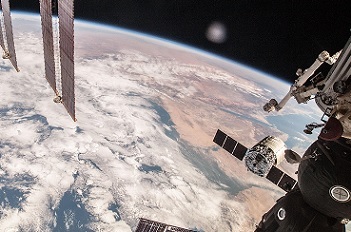 There they installed the experiment on a universal work platform, via the mating of two connections, followed by confirmation of good telemetry from ground controllers. Expose-R is a part of a series of experiments that investigate the influence of space conditions on organic material. Next, the cosmonaut duo moved to the Automatic Phased Array Antenna (AFAR), which they installed on the previous Russian EVA. There they installed an additional handrail clamp holder. The duo then took samples from windows on the Russian segment, checking for how plumes from the Russian thrusters interact with the outside of the Station’s hardware. The next experiments the crew attended were are SKK and Vynoslivost. They removed SKK Cassete 1 from the Poisk module and install SKK Cassete 2 in its place. They also removed the panel 2a belonging to the Vynoslivost experiment. Both SKK and Vynoslivosts are slated to be brought back to the ground on a Soyuz vehicle for further study. The final task on the EVA timeline was the the isolation and retrieval of a Biorisk experiment container. Biorisk investigates how microbial growth affects materials in the vacuum of space. The spacewalkers first isolates the experiment inside a plastic bag, and then brought it inside the space station for return to the ground. Other tasks on this EVA included the installation of a Plume Impingement and Deposit Monitoring unit on the Poisk module. This EVA – that was set to last over six hours, but was completed in just over five – was the second for both spacewalkers following their work on EVA RS-38 – and is the 181st in support of the space station assembly and maintenance. The US EVAs – two of which were planned for this month – were recently put on hold. The postponement came after ground testing revealed an issue that resulted in a loss of confidence across the set of Extravehicular Mobility Unit (EMU) Long Life Batteries (LLBs). This issue has no commonality with the Russian EVA suits. The return of the American EMUs to operation will have to wait until replacement LLBs can be lofted uphill on the SpaceX Dragon during her CRS-4/SpX-4 mission. The latest Commercial Resupply Services (CRS) mission is currently scheduled to launch on September 19, dependant on the successful Falcon 9 v1.1 launch with the ASIASAT-6 satellite. That launch is scheduled for a NET (No Earlier Than) target of August 26, as SpaceX proceeds through what will be a record year of launches for the Californian company. It is understood the LLBs riding up on the Dragon will return the Station to a compliment of working EMUs for the EVAs to be rescheduled, while additional spares are likely to be launched on the next Cygnus spacecraft. The ORB-3/CRS-3 Cygnus is set to launch in October, following on from the recently concluded ORB-2 mission that ended with the spacecraft’s destructive re-entry on Sunday. In other Station news, the recently arrived ATV-5 performed her first docked task aside from her cargo delivery, as her Orbital Control System (OCS) thrusters conducted a reboost tested ATV reboost to set phasing requirements in support of the upcoming departure of Soyuz 38 on September 10 and the arrival of Soyuz 40S – utilizing a four-orbit rendezvous on September 25. Additional reboosts are planned for August 27 and September 18, which will finalize the phasing for those two major events. (Images: Via NASA, Roscosmos and L2). (Click here: http://www.nasaspaceflight.com/l2/ – to join L2 and directly support NASASpaceflight.com).